It’s been a few weeks since I’ve met up with Melanie (aka Splendid Sweets). It seems the closer you get to the holidays, the busier you get. But this time I visited my pal, she did not show me how to cook. Well, I take that back. I got a quick lesson in making caramel. But we didn’t make dinner together. 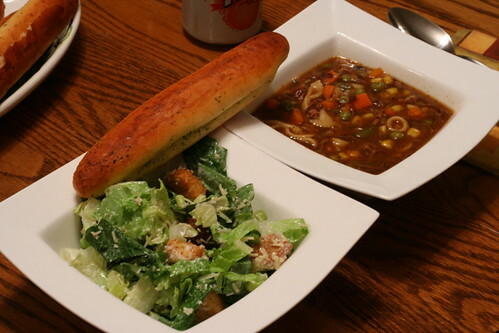 She whipped up something fast and yummy: soup, salad and bread sticks. 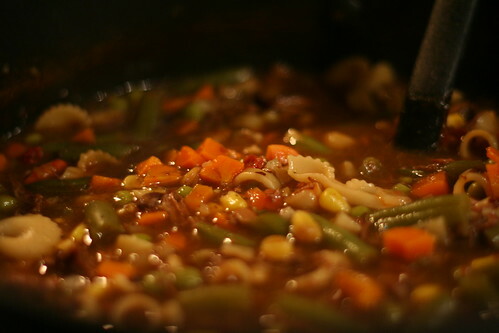 Hello minestrone. How you doin’? 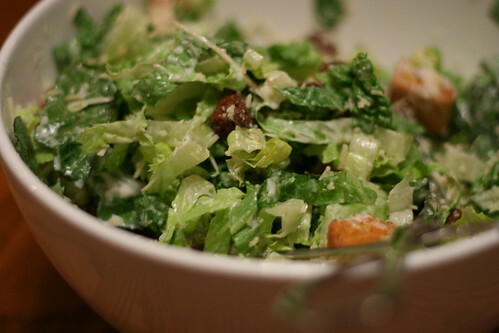 And Caesar… I never knew you could look that good. And a long lost friend: Big Red. No. 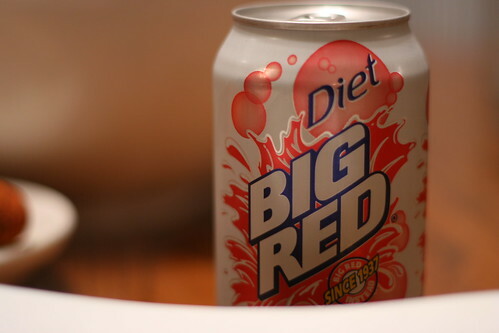 Diet Big Red. Red cream soda is a weakness. A big big weakness. Since 1937. Put it all together and we got ourselves a great dinner. And it was FREEZING this day so soup was perfect. This was delicious. And I ate it for lunch the very next day. I think Mel sprinkles pixie-chef dust on food when I’m not looking because everything that is produced in this kitchen tastes so good. Mel did A LOT of baking before I even showed up on her doorstep. And these little guys were all waiting for me to the eat them. So I did. And I stole some and took them home. 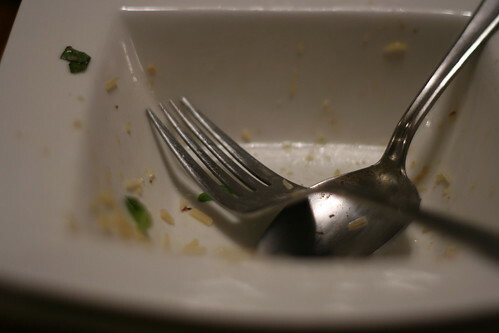 And ate those. And I didn’t share any of them. So why did we get fast, friendly and fun with dinner? Because I was the teacher this night. I showed Mel how to make Bourbon Balls. They are not hard to make, just time consuming. So we mixed them and put them in the fridge. Then balled them up and put them in the fridge. And then dipped them and topped them with pecans and returned the little suckers to the fridge. I’m not lying, it takes a while. But it’s worth it. In between the mixing and rolling and dipping, Mel made caramel. And we experimented with our cameras. Mel wanted to capture hot breathe in the freezing cold air. Harder than we thought. Much harder. The wind wasn’t playing nice. 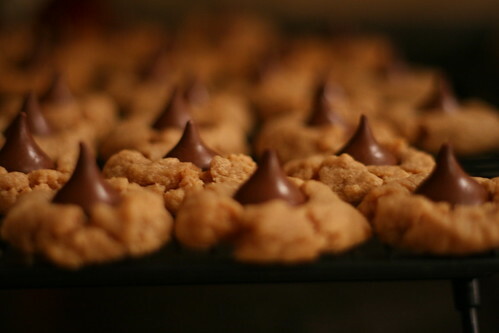 I thought I had a brilliant idea – use powdered sugar to create “hot air”. So I stuffed my mouth with powdered sugar. FAIL! It immediately melted into every crevice of my mouth. And then I had a mouthful of mushy sugar. Didn’t see that one coming. And I didn’t see this one coming either. 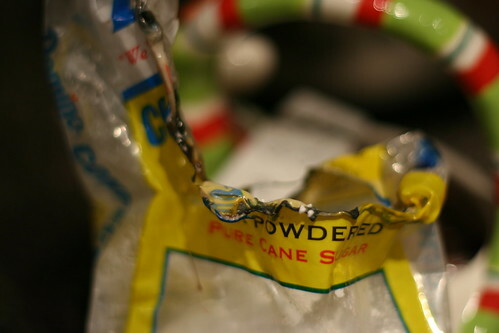 This happened only about 30 minutes after Thurmeo (Mel’s husband) said “Don’t burn the house down.” When I walked in with my mouth full of insanely sweet powdered sugar, I tossed the bag on the counter. And it fell into a candle. Seriously, Brooke? Thurmeo just said not to do this and viola, you’ve gone off and committed arson in this sanctuary? 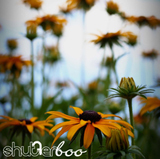 ~ by shutterboo on December 14, 2009. I’m so jealous! Maybe one of these days I can join you lovely ladies for some dinner. Looks good!!!!! Well I’m hoping I get to see this Saturday! Missing you tons. why can’t you and mel live near me? i think cooking for a total stranger would be a great exercise for you both. Oh, she cried…and I laughed! Don’t tease her too much it may make her cry again 😉 After last week I may have to reevaluate if she is safe to come over, I kid I kid!